There was no nomination for the additional candidate(s) which we announced on Tokyo Bulletin No.75 issued on the August 31, 2012. We plan to resolve the election of officers and Executive Committee members which announced on the Tokyo Bulletin No.75 on the next Annual General Assembly. Therefore, they will assume the post of officers and Executive Committee members from January 1, 2013. 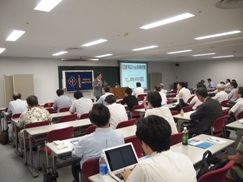 The 2012 Eighth Lecture of IEEE Tokyo Section was held in cooperation with The Institute of Electronics, Information and Communication Engineers at Kenshu 1 on the 3rd basement floor of Japan Society for the Promotion of Machine Industry with 71 participants on Tuesday, September 19th, at 4:30 p.m. The lecturer was Dr. Jun Murai (Professor of Keio University, recipient of 2011 IEEE Internet Award). After the introduction given by Prof. Aoyama, IEEE Tokyo Section Chair, Prof. Murai gave a lecture entitled "Research on the Internet", within which he eloquently covered from the dawn of the computer communication era, academic contribution of WIDE project and investigations on latest topics such as big data and security. The lecture was succeeded with quite active Q&A from the audience. The 2012 Ninth Lecture of IEEE Tokyo Section was co-held commemorating the IEEE Day 2012 with Life Members Affinity Group (LMAG) and Tokyo GOLD Affinity Group and Japan Council Women in Engineering (WIE) at Arcadia Ichigaya, Daisetsu on the 5th floor with 51 participants on Friday, September 28th, at 2:00 p.m. The lecturer was Dr. Yasuo Hirata (President of ATR, recipient of 2006 IEEE Award in International Communication). After the introduction given by Dr. Habara, LMAG Chair, Dr. Hirata gave a lecture entitled "Progress of ICT and Necessary Attitude Towards Globalization", within which he first explained the progress of ICT (Information Communication Technology) as one of the greatest revolutions in human history. Then he addressed the expectation to young researchers and engineers, referring to his ICT-oriented activities and the experience. 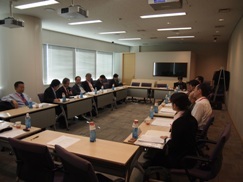 The 2012 Third Meeting of Tokyo Section Executive Committee was held on Friday, October 19, from 3:00 p.m. at Shiodome City Center, Tokyo. 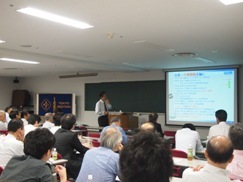 The 2012 Tenth Lecture of IEEE Tokyo Section was held in Japan Society for the Promotion of Machine Industry Hall, on Tuesday, Oct. 26th, at 3:00 p.m. The technical lecture entitled "Semiconductor industry and mission of venture business --- Importance of both wings for innovation creation" was lectured by Dr. Tetsuya IIZUKA, Founder and CEO of THine Electronics, Inc., the recipient of the 2012 IEEE Ernst Weber Engineering Leadership Recognition Award. In this lecture, he talked about his interesting history and experience as a semiconductor engineer, a researcher at a major company and the founder and CEO of the venture company, THine Electronics, Inc. Also, his experience about support other venture businesses was included in this talk. He emphasized here the importance that two wings - a large organization composed of major companies and universities and a young organization composed of venture businesses - exist well together. Furthermore, he presented the strong message, "to win and advance in this three-difference-era". The first is the countries, in other words, globalization. The second is the technology fields. The last one is the time constants. His talk gave the stimulative and deep impression to 75 audiences. 2012 IEEE Region 10 Annual Meeting was held in Kolkata, India from Saturday, March 3rd to Sunday, the 4th, 2012. Delegates including guests and representative from IEEE head quarter, Region 10, Councils and Sections, and total number of official attendee was 109 (from Region 10 site), including 14 from Japan. Prof. Aoyama, Tokyo Section Chair and Dr. Gambe, Tokyo Section Vice Chair and Dr. Arimoto, Japan Council Secretary attended this meeting. 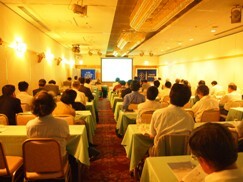 The third Technical Tour of Life Members Committee was finished in Japan from 20 to 28 May 2012. The 27 attendees, 16 life members and 11 spouses, checked in the hotel in Kyoto by the evening of the first day and the tour started next morning. The first visit was to Sharp Historical Hall* in Tenri, Nara, and on the second day to Keage, the oldest hydropower station of Japan and Biwa Canal museum located in Kyoto. Also they visited the famous temples in Nara and Kyoto and enjoyed the welcome dinner in Kyoto by Kansai Section. On 23 May, they moved to Nagoya, and visited the Railway Park of JR Central*, and Nagoya Section welcomed the visitors at Tokugawa-en restaurant. Next day, visited the Yosami Museum* in Kariya, and Toyota Museum exhibiting the textile and automobile industries. Then, they moved to Tokyo getting on the Shinkansen Train “Nozomi”. In Tokyo area, they visited the museums of NHK*, Seiko*, Toshiba*, TEPCO, JVC*, and enjoyed the visit to Edo-Tokyo museum where they could learn the dramatic changes from Tokugawa shogunate to the modern Japan. All participants enjoyed the tour and could deepen their insight into the histories of technology and industries of Japan. Also they improved their understandings to Japanese culture through the visits to several museums, temples and shrines. "*" indicates the organization was awarded the IEEE Milestone.